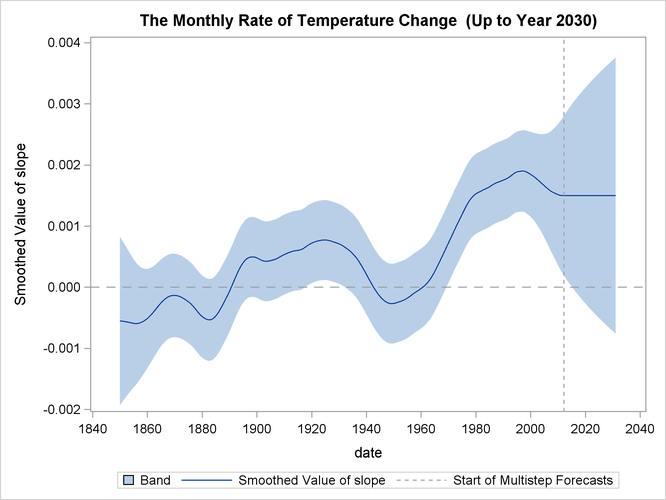 In a presentation by Ansley and de Jong (2012), three monthly time series are jointly modeled to obtain long-term—several decades long—temperature predictions for certain regions of the northern hemisphere. This example shows how you can specify and fit the final model that this presentation proposed. 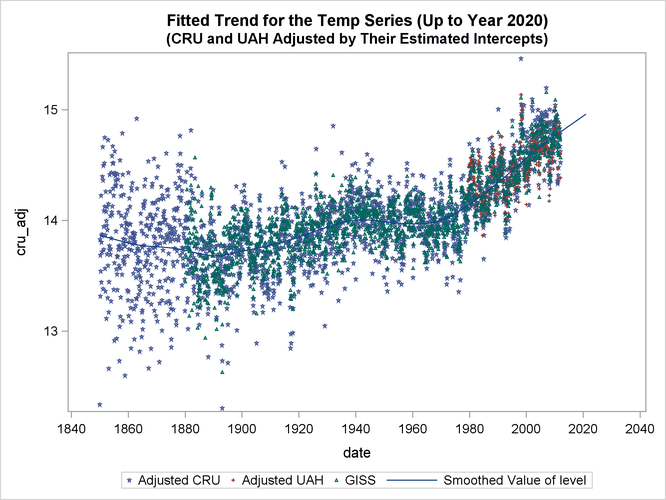 The following data set, Temp, contains four variables: date dates the monthly observations; UAH contains monthly satellite global temperature readings, starting in December 1978; CRU contains monthly temperature data, starting in January 1850 (from a different source); and GISS contains monthly temperature data, starting in January 1880 (from yet another source). All these temperature data are scaled suitably so that the numbers represent temperature readings in centigrade. where and are intercepts that are associated with CRU and UAH, respectively; is an integrated random walk trend; is a zero-mean, autoregressive noise term (which is scaled by an unknown scaling factor a); and ( ) are independent observation errors with different variances that are also scaled suitably. Note that the trend and the autoregressive noise term are shared by the models of the three series, and, for identification purposes, the intercept for GISS is taken to be zero. In addition, the model parameters are assumed to be interrelated and are parameterized in a particular way (which leads to fewer parameters to estimate, and their relative scaling helps in parameter estimation). This special parameterization can be expressed as a function of seven basic parameters: loga1, logr1, logr3, logsigma, b, c, and rhoParm (this naming convention is different from that used by Ansley and de Jong (2012)). where = 1,945 (the number of observations in the unappended data set). For 1,945, it is fixed at its last value: . Output 27.12.2 shows the estimated intercepts and . As expected, they are quite close (see the scatter plots of CRU and UAH in Output 27.12.1). The estimates of the basic parameters that underlie the model parameters are shown in Output 27.12.3. The following DATA steps add two variables (CRU_ADJ = CRU – and UAH_ADJ = UAH – ) to the output data set For. These adjusted versions of CRU and UAH have the same mean level as GISS—estimated . 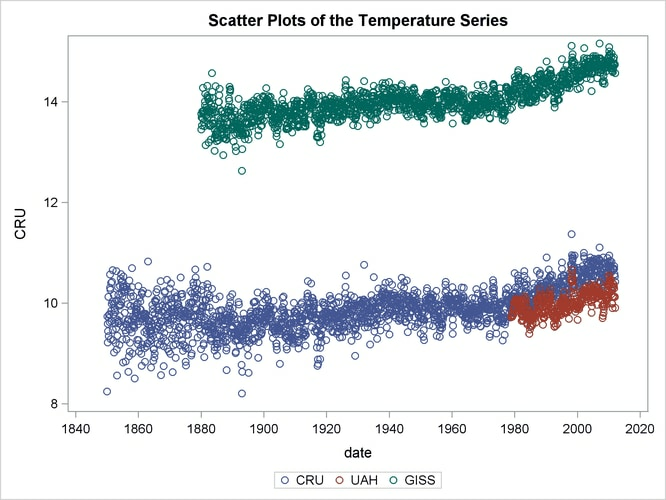 The following statements produce a graph that contains four plots: scatter plots of GISS, CRU_ADJ, and UAH_ADJ and a series plot of the estimated . scatter x=date y=cru_adj / LEGENDLABEL="Adjusted CRU"
scatter x=date y=uah_adj / LEGENDLABEL="Adjusted UAH"
Output 27.12.4 shows the resulting graph. It shows that the estimated mean level tracks the observed data quite well. 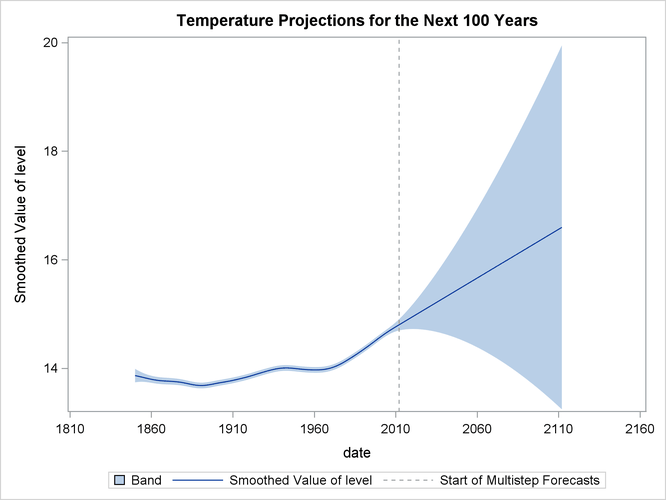 LEGENDLABEL= "Start of Multistep Forecasts"
Output 27.12.5 shows the resulting graph. Output 27.12.6 shows the resulting plot of the estimated slope of . Based on the preceding analysis (see the plots of and its slope in Output 27.12.5 and Output 27.12.6), it appears that there has been statistically significant warming over the last 10 years, but the warming does not appear to be accelerating.